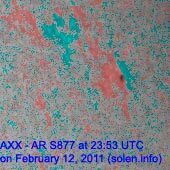 Last major update issued on February 14, 2011 at 05:10 UTC. 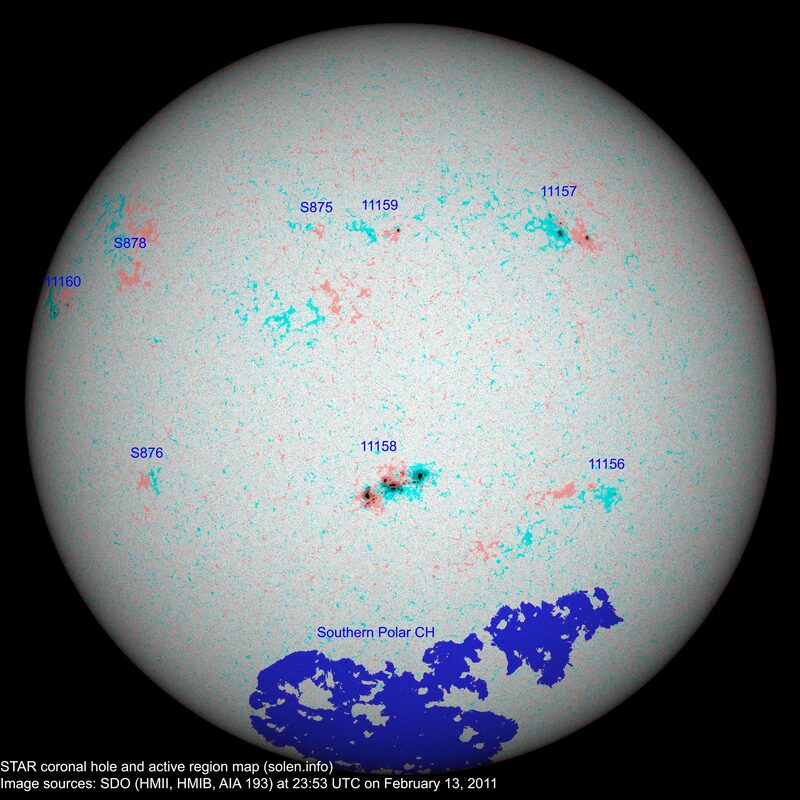 The geomagnetic field was very quiet on February 13. 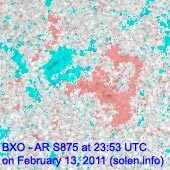 Solar wind speed ranged between 286 and 360 km/s. 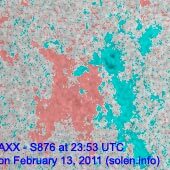 Solar flux measured at 20h UTC on 2.8 GHz was 106.8 (increasing 25.0 over the last solar rotation - and a new high for cycle 24). The planetary A index was 2 (STAR Ap - based on the mean of three hour interval ap indices: 1.9). 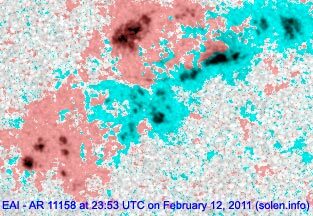 Three hour interval K indices: 12211101 (planetary), 11212110 (Boulder). Region 11156 decayed and could become spotless today. 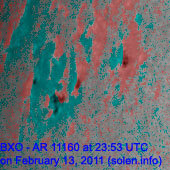 Region 11157 decayed in the southern part and added a few new spots in the north. 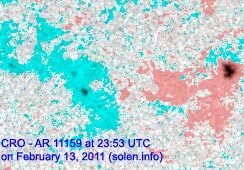 Region 11158 developed very quickly into the largest and most complex region observed during cycle 24. There are 3 large penumbrae containing many spots. The central penumbra is complex with an unusually strong magnetic delta configuration and a long neutral line. 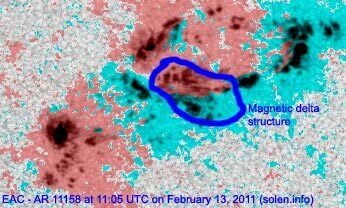 Even the trailing penumbra has a weak magnetic delta structure near its northern edge. There's currently a high likelihood of further major flares, the region has X class flare potential. Flares: C1.1 at 12:36, C4.7 at 13:56 and M6.6/1N at 17:38 UTC. The major flare was accompanied by a weak type II and a moderate type IV radio sweep. 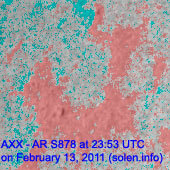 A small CME was observed. Region 11159 didn't change signif and was quiet. 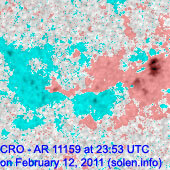 Region 11160 rotated fully into view and has only a few small spots. 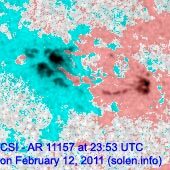 Two opposite polarity spots are poorly separated and there's a chance of C flares. 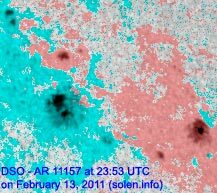 Flare: C1.4 at 07:29 UTC. February 11-12: No obviously Earth directed CMEs were observed in LASCO or STEREO images. 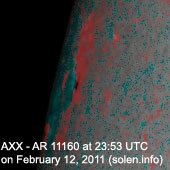 February 13: A small CME was observed after the M6 flare in region 11158. 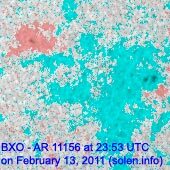 It is likely to be Earth directed and could reach Earth on February 15 or 16. 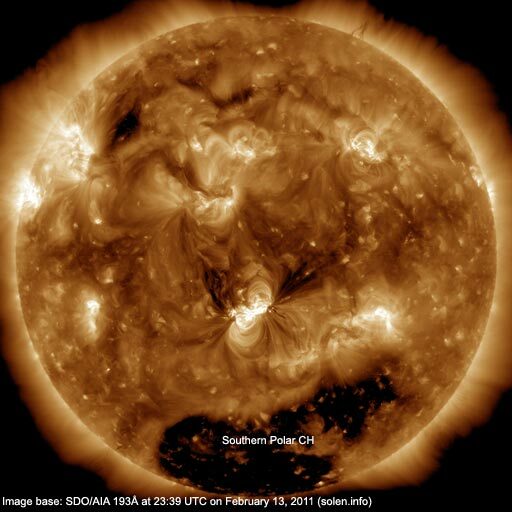 The geomagnetic field is expected to be quiet on February 14. 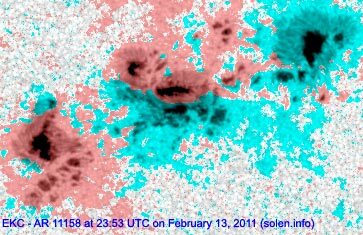 On February 15 and 16 there's a chance of CME effects with unsettled to minor storm conditions possible.